So I survived NeoCon 2011. My take this year was that I did not see any earthshaking new ideas or products or anything that was really new. Don’t get me wrong, there was some really cool stuff. But I felt like I had seen most of it before. Overall, I found it interesting that I saw more similarities among the products offered than differences. Well you might say that to the untrained eye, a desk is a desk. And you might think that as a large company, the conservative thing to do is to copy the competition. However, many of the big manufacturers have independent research teams that study people, and how they work. These teams study every aspect from anthropology, sociology, physiology, ergonomics, generational differences, technology, learning and more. Then, they look at practices, processes, and communication. (Maybe I’m not hearing the really top secret stuff, that will be at next year’s show, but you think that you might see some big differences evolving out of different models and different research.) All of that research results in unique design or the application of a piece of furniture, but there is a larger pattern. What I also saw were parts. That may sound a little strange, but by parts, I mean a greater variety of deconstrucable work tools that bring increased flexibility or adaptability to multiple tasks or configurations. Desks where you can have a pedestal file or not have one; dividers that you can have up or down, lamps, files, and cables. It’s all about having a variety of space, tools and making changes, adapting and flexibility for a variety of constantly changing tasks. That pattern reflects how we are working today and maybe more about how we will be working tomorrow. We all know collaboration is huge, promoting innovation within an organization and just trying to get people to communicate and share ideas is one of the big challenges of any organization. It is also about the different types of work we do: meetings, writing, reading, thinking, calculating, and researching, for example. There is a combination of different activities too; working, relaxing, eating, entertaining, studying, communicating, and interacting on lots of surfaces, boards, and screens. Integrated power outlets and greater wireless access is pretty much everywhere now. You don’t need to be physically connected — you can work anywhere. Technology has really enabled us, and so we have more locations — work at home, telecommute, the third place (and now coworking) are all offering increased flexibility, productivity, and connections. Many of the solutions are focused on the team, the group, and the office — and what I saw at NeoCon reinforced that. Individuals clearly don’t need as much. While technology minimizes the need, there is still a need that people have to be where the knowledge is. You need to see it, feel it and hear it to understand how to interact with it. Individuality is alive and well. The private office will be around for while. It is focused on the individual. There is a significant amount of product being created and sold — probably because there is demand. The workstation is still the mainstay of the corporate world, and still focused on the individual — but the walls are practically gone, more seats are built in, and there are more monitors. Individual storage has just gotten smaller, or maybe we are not carrying as much stuff around with us anymore. There are the numerous benching solutions. These allow a number of workers to work together and increases interaction and collaboration. These are also flexible and highly efficient when used by groups or teams. It is about making it easier for people to meet and work. Many of these new components are easily reconfigurable and all about enabling people to create their own environment or about the environment adapting to the needs of the individual or team. Teams may be remotely located, but you will still push or adjust that video screen to accommodate that communication. Everything it seemed can be moved, pushed, lifted, rearranged, assembled, and disassembled. Kind of like Lego and Tinker Toys. Build what you need when you need it. The way we work is changing and those environments required to support work must change as well, along with everything that you put in them. The new trends for the physical work environment are all about adaptability and flexibility. It is combinations of the seating, desk tops, expanding and contracting and integrating technology. There has been a lot of research on generational differences and how we work, or think about work. In the end, what I am seeing is the ability of the work environment to adapt and change based on who is working and what is being done. Different work and different size teams can now be accommodated. We have evolved from those kitchen pantry areas located in the dark back of office location from 20 years ago to comfortable cafes and places that are centrally located, open and filled with light. Those environments are much more productive as opposed to sitting in a private office. These areas are located on primary circulation paths. They generally are much more public and open and provide a variety of seating and working arrangements. The components get pushed around and mixed and matched. Some are fixed, but people can easily move in and out of them. 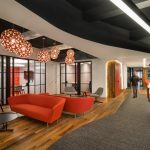 While these environments look highly professional, there is an essence of college dorm, library, cafe, living room, reception area and class room in the modern office. There is a combination of work space, relax space, eating space, entertainment space and study space and areas to communicate, interact and learn. Lots of tackable surfaces, white boards, and flat screens. The chairs all move around. In most cases, the private offices (at least the ones I see) are all strangely quiet and empty. Conferencing facilities are also providing many more meeting and seating configurations. Both open and enclosed — you need both. But the technology is fully integrated, and communication and ideation tools abound. Sizes can range from 2-3 to large assembly spaces and how you interact may change slightly, but it is all about providing an effective work environment that is comfortable and productive. The variety of space and the components continue to grow and NeoCon certainly reinforced that, but I didn’t find it all in any one showroom. I saw pieces of it. And when I step back and contemplate what I just saw and try and to comprehend what was significant, no one item stands above the rest. But what do you think; what were the big items? Thank you for the review on NeoCon 2011 in Chicago. I have never had the opportunity to go to one, but was very interested in some of the programs that went on this year as a colleague of mine presented some of their concepts of what learning in the workplace will be like going forward. As I read the review, and you talked about “pieces and parts”, I was wondering if you had any comments on learning spaces in the new “collaborative office” environment. A recent study by the Masie Center, a corporate learning collaborative, showed that while many expected classrooms as a learning place to be on the decline due to shifts in e-learning/individualized learning, the exact opposite is true. 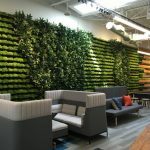 Many companies now want to shift these facilities to do dual-purpose and be available for classes, meetings (they always were held there, nothing new here), and projects/collaboration efforts. To do this, classroom spaces will have to be up-to-date with proper furnishings, environments, and equipment to do the job. I look forward to your views on this. You’ve hit on a very juicy topic, I can’t possibly cover it here, but might make for an upcoming issue of Workspace Design Magazine. Here are a few points that I think are worthwhile. The Masie Center is an innovative think tank that focuses on learning, specifically for Corporate America. Your observation is correct, learning is a very collaborative process and depends on high levels of interaction. Classrooms are being redesigned and Corporations are realizing that organizational knowledge is only developed when teams of people collaborate effectively. I expect that you have seen Masie’s trends for 2010, but if not here is the link: http://www.masie.com/Research-Articles/learning-in-2010.htm There are a number of these trends that affect the environments that we work and learn in. Laurence Prusak, http://www.laurenceprusak.com/ has written a number of books on this topic – knowledge, knowledge workers, workspace and organization. I had the pleasure of hearing him speak at Worktech11 in NY (see Erikas Manno’s article on Worktech11 – The Future of the Workplace: https://workdesign.com/2011/07/worktech-11-the-future-of-the-workplace/) he says “you need to go to where the knowledge is”. As for me, I learn from my colleagues everyday, our environment is completely open – no private offices. Technology is a critical factor and I think you will see more and more monitors migrate into team areas and the work station. I believe that anything (or person) that slows down the flow of information and building knowledge is competitive dis-advantage and will eventually be eliminated – provided they learn they need to eliminate it! This could be an interesting collaborative article between both Bob and Mike. I would like to hear both points of view / thoughts on this!! !